At a conference, wedding or birthday party: With this businesscard-size name tag your employees, clients or guests will look their best. This name tag is easy to attach, protects the clothing and assures strong adhesion. This name tag includes a card holder, a metal plate and a counterpart, which contains two neodymium magnets. Caution: People with pace makers need to wear this name tag on the right side! A warning is attached to the backside of the magnet. Just slide in a business card and your name tag is ready! You can always reuse it, which is good for the environment and your wallet. For a wedding, anniversary or birthday party: Create your own cards that are appropriate even for festive events. 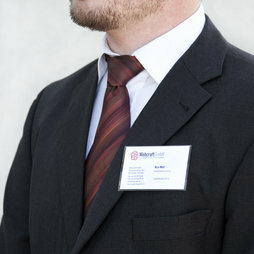 Thanks to the magnetic fastener you can attach the name tag without needle on a festive blouse or dress. Even thick fabrics, such as a leather jacket as depicted, are no problem for the M-35. The names tags will be delivered in this practical and stackable box. Each box contains 10 pieces and makes a good storage container for the name tags. For quick, individual and professional printing (laser and inkjet) of business-card-size cards (54 x 85 mm): Avery Zweckform C32011. Enough for 100 business cards. Convincing trio: Name tag Freestyle, the smart name tag holder for any size. Name tag Business, the business-card-size name tag and the Avery Zweckform C32011 for individual printing of suitable cards.